How fantastic would it be if a group of managers from across your business came up with a well researched idea, product or service that would give you competitive advantage, increased revenues or reduced costs? One of the ways we help with this is the ‘Dragons’ Den’ concept. Within our management development programmes, we can task delegates to work in small teams (usually cross-functional) to incept and develop a business idea that will be pitched to senior directors at the close of the programme. During the workshop, your commercial and business skills are developed in areas such as innovation, research, stakeholder management, marketing, strategy and effective presentation such that you produce and pitch a comprehensive business case. NO we will not invest because…..? YES we like it but we think you need to do further work in certain areas. We have seen some amazing results over the years including many ideas that have been successfully carried forward into the business, delivering significant contribution to the bottom line. Not every idea is taken up but without exception, the process absolutely ensures that when you participate in our Dragons Den, you will grow in confidence and competence, and take ownership for business results – in effect becoming internal entrepreneurs for the company. 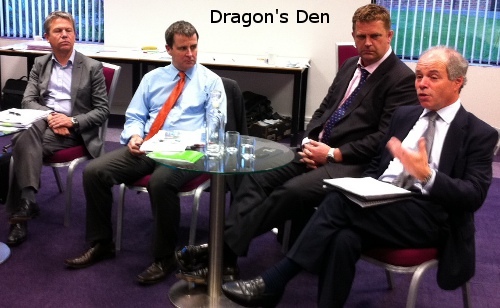 Read what previous delegates have to say about Dragons Den and our other programmes!